The numbers of youth experiencing homelessness can only be estimated, but we do know for certain that LGBQ youth, transgender youth especially, are much more likely to experience homelessness than their peers. These are youth whose very survival depend on being hidden, often in plain sight. One youth slept in a tree, in an urban area, next to a busy hotel. Others find empty building to squat in, or sleep under bridges. Some sleep hidden in parks. You may see their tents. You probably won't. Youth homelessness happens for many reasons, often poverty and family disruption are primary factors. LGBTQ youth homelessness often happens because parents kick their kids out. Best estimates are that 42% of youth experiencing homelessness identify as as queer or LGBT, and 50% of those youth were kicked out by religious parents or families. Click to read or download now, the next volume in Parity's FaithForward series, Faith-based Approaches to Addressing and Preventing LGBTQ Youth Homelessness. Every youth experiencing homelessness has a unique story and the reasons youth find themselves on the street are varied. Many LGBTQ youth become homeless for economic reasons - their families simply don’t have enough money to provide shelter and food for them. In some cases, adolescent youth are driven from their home of origin by the feeling that they are a burden on an already economically stretched family. Some LGBTQ youth run away from physical, sexual and verbal abuse the may or may not be related to their sexual orientation and/or gender identity and expression. Others are kicked out by their parents or caregivers, told “Come back when you have straightened up.” Let’s pause here. This is unbelievable, right? Parents don’t kick their kids out for being LGBTQ, right? Parents DO kick their kids out for being (or even appearing as though they might be) LGBTQ. About half of the youth experiencing homelessness that we have worked with had been kicked out by parents from traditional (not LGBTQ-affirming) religions and faiths. Second, not a single one - not ONE - of the hundreds of homeless youth we worked with ever expressed anything but love and longing for their parents and families. Even after being physically or sexually abused, or being told horrific things, like “I wish you had never been born,” youth defend their parents. In fact, youth often said that they didn’t want anyone to know they had been kicked out, they didn’t want their parents to get in trouble! The irony, of course, is that in many states that value parents rights over children, a parent will not get in trouble but the kicked out child can be arrested. The good news hidden here is that often, with education and support, families can learn and grow together, becoming a facilitator of positive development for their LGBTQ youth. Faith communities are uniquely positioned to provide this education and support to families. 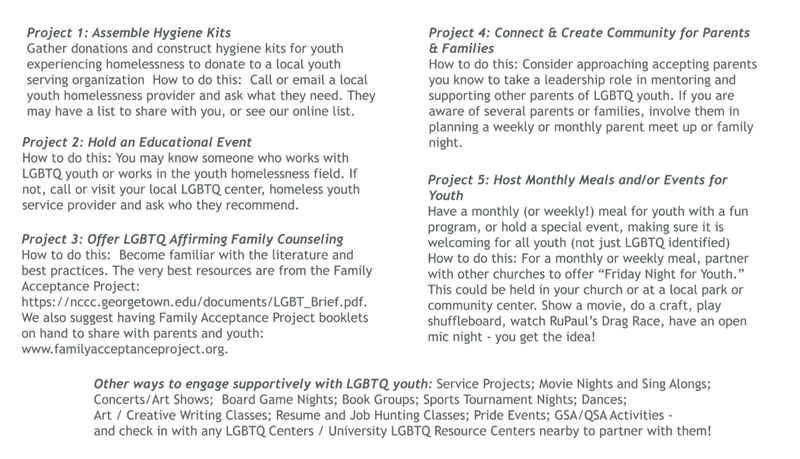 For other LGBTQ youth, positive interaction with their family of origin (or foster family, extended family, etc.) is not possible. For these youth in particular, contact with accepting, affirming, and empathetic adults is absolutely critical. Creating a community and safe space for these youth literally saves lives. And you have the ability to do just this. Keep reading. Click to read or download now. Chapter Three: Why Churches and Faith Communities? What can faith communities do to prevent LGBTQ youth homelessness?